Vehicle hire is often overlooked until the last moment, but if you want to make a stylish entrance it’s important to consider how transport will fit in with your wedding. To help relieve some of the stress and prevent you from becoming bridezilla, here is a guide to the various transport options available to couples on their big day. 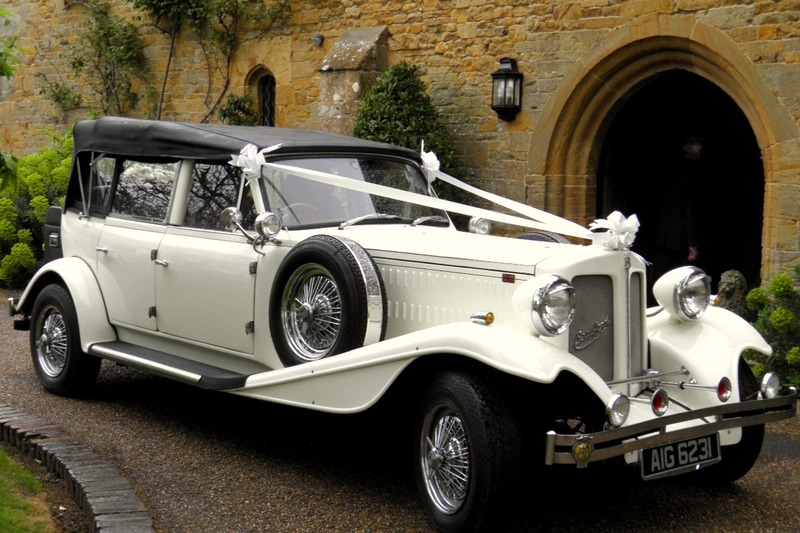 Classic cars evoke a timeless sense of tradition that will delight any bride on her big day. Being chauffeur driven to the venue in a Rolls Royce, Bentley or any other classic model will provide a sophisticated yet understated arrival worthy of royalty. Not only will a classic vehicle perfectly complement a church or vintage wedding, it will make for astounding photography that will remain everlastingly elegant for years to come. Kate Middleton famously rode to Westminster Abbey in the Queen’s 1977 Rolls Royce Phantom VI. The majestic Silver Dawn is another vintage model that boasts grandeur, while a classic Bentley will make an equally impressive choice. It is important to consider the size of the party travelling with the bride and the size of the bride’s dress. A classic Daimler can fit up to seven people into the car and, considering the back seats fold up to accommodate larger dresses, could provide sophisticated yet practical transportation. Many brides and grooms choose wedding themes inspired by their favourite periods of history. For instance, arriving in a 1920s sports car is the perfect way to bring some Great Gatsby chic to your wedding. An iconic Duesenberg or Buick can bring the decadence of the golden age when big bands and big cars were all the rage. Smacking of old school cool, hiring a Cadillac convertible straight from the 1950s is sure to raise some eyebrows. Elvis Presley and Teddy Roosevelt both drove Cadillacs, and with more than 100 years of heritage and an image like no other, you’ll make an entrance worthy of their prestige. Carefree couples planning a retro festival style wedding will love the idea of arriving in a 1960s VW Beetle or Camper Van. With an effortlessly cool sense of nostalgia, these vehicles can be customised to follow wedding traditions and suit the style of your wedding. For instance, the vehicle can be adorned in floral garlands, while tin cans can be attached to the car’s bumper, exuding classic movie romance as the newlyweds depart. For an endearing alternative to four-wheeled transport, you could opt for a vintage motorcycle and sidecar. These three-wheelers deliver a nostalgic and romantic first ride together as newlyweds. Another option is to bring some continental charm to your wedding by travelling via Vespa. Audrey Hepburn and Gregory Peck epitomised the romance of these Italian scooters in the 1953 classic Roman Holiday. The glamorous Hollywood couple stylishly rode around Rome on a Vespa, and you can ride to and from your wedding in the same style.Alternately, you could ditch motors altogether and go for an eco-friendly tandem or vintage bicycle. Push bikes are decidedly cheaper than automobiles and motorbikes, so if your budget allows you could consider arriving in a convoy of your own groomsmen and bridesmaids. However, pushbikes and tandems are unsuitable for venues far away, and you may struggle getting to the airport on time if you’re jetting off on a honeymoon straight after the ceremony. If you do decide to travel via bicycle remember to choose a suitable wedding dress and have a simple hairstyle that can be quickly fixed upon arrival. It’s also important to consider the weather – bicycles are perhaps best kept to the summer months when there is less chance of wind or rain. To help calm last minute nerves, the bride and groom may prefer to travel to the wedding venue with their guests. Hiring a vintage bus is a great way of setting the mood for the day and getting everyone on board. Guests will feel like an important part of the proceedings without taking attention away from the newlyweds. An iconic London double-decker from yesteryear brings a vintage aesthetic to a wedding, while the striking red paint makes for some stunning photographs on a backdrop of green trees and blue sky. Personalised tags can sometimes be displayed on the bus with a message of congratulations to the happy couple. However, if you’re planning on popping open some champagne, don’t forget to double-check that the rental company is licensed to do so. What car did you have at your wedding?